The Jesus Bible Releases in Spanish with Featured Contributions from Louie Giglio, Max Lucado, John Piper, Ravi Zacharias, and Randy Alcorn--Reveals That "There Is No B.C." GRAND RAPIDS, Mich., Feb. 11, 2019 /PRNewswire/ -- The birth of Jesus in Bethlehem isn't the beginning of the story of Jesus. The entire Bible points to him. That's why there is no B.C. Filled with 66 book introductions, over 1,000 articles, and seven compelling essays by bestselling authors Louie Giglio, Max Lucado, John Piper, Ravi Zacharias, and Randy Alcorn, La Biblia Jesús (The Jesus Bible) helps readers follow the thread of Jesus from cover to cover. Discover a new depth to the Bible's meaning as readers see him in every chapter of the story. Louie Giglio, who served as general editor of the project, shared: "The Jesus Bible helps people understand from the very first page that the Bible is one story in 66 books, and it is all about one person. From Genesis to Exodus, to Romans, Acts, the prophets, Psalms, the gospels…the whole book is about Jesus." Giglio, pastor of Passion City Church in Atlanta, Georgia, continued, "We had the opportunity to create a resource that I hope is going to change future generations and help Scripture come alive so that Jesus is standing on every single page, so that as you read the Bible, you understand Jesus throughout the Bible." More than 165,000 copies of The Jesus Bible (English) have entered circulation since its launch at Passion Conference in January 2017. 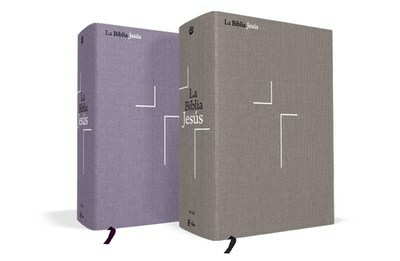 La Biblia Jesús NVI (Spanish) will go on sale February 26. It is available in two beautifully designed covers: gray and lavender cloth over board. Louie Giglio is the pastor of Passion City Church in Atlanta, Georgia, and the founder of Passion Conferences, a global movement uniting college-aged people to live for the fame of Jesus. With a desire to elevate God's glory above all else, Louie has authored Goliath Must Fall (available in Spanish: Goliat Debe Caer), The Comeback, The Air I Breathe, I Am Not But I Know I Am, and Indescribable, which was co-authored with Grammy-Award winner Matt Redman. Louie and his wife, Shelley, live in Atlanta, Georgia. Passion Publishing is a book publishing imprint committed to lifting and amplifying the messages of the Passion Movement and Passion City Church. As a movement, Passion is focused on glorifying God through a winsome life leveraged for the name and renown of Jesus. Launched in 2014, Passion Publishing has published notable bestsellers The Comeback and Waiting Here for You (Louie Giglio), and Good Good Father picture book (Chris Tomlin and Pat Barrett). The imprint partners with HarperCollins Christian Publishing. The Nueva Versión Internacional is a modern translation of the Holy Scriptures made by a group of Bible scholars representing more than twelve Spanish-speaking countries and several Evangelical Christian denominations. The best available editions of the Hebrew, Aramaic, and Greek texts were used for this Spanish translation. The main characteristics of this new translation are clarity, fidelity, dignity, and elegance. These are guaranteed by the careful work of the translators, all of them renowned experts in different fields of biblical knowledge. Several of the translators are pastors or professors in seminaries and Bible institutes in different cities throughout the continent, and all are fervent believers in the Word as the infallible revelation of the divine and only rule of faith for all.